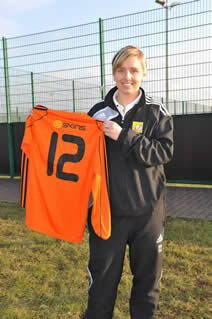 Glasgow City are delighted to announce the signing of Donna James. Donna comes back to her first ever club, having signed for City as a fourteen year old, eleven years ago. One of very few players who can boast having played for all Scotland youth teams and the senior A squad in one season, without doubt, Donna is recognised as one of Scotland's greatest ever talents. Commenting on his latest signing, Manager Peter Caulfield said, "DJ was an exceptional talent with this club during her youth a number of years ago. Since then she has played for a few other teams and has had long spells out of the game. However, after discussions, she has showed us a real determination and focus to reach her peak and feels Glasgow City is the right club for her to achieve her goals. I have no doubt with her hard work, she will be a huge asset to this club and another great member of our already impressive squad."